Th-INK-ing of You: June Release Blog Hop! Hello friends! Welcome to the Our Daily Bread designs June Release Blog Hop! If you got here from Dawn's Fabulous Blog, you are in the right place! If not you might want to start at the Our Daily Bread designs Blog and start from there so you don't miss any chances to win free stamps!!! All the sticks in the bread basket have been having soooo much fun with all the fantastic new sets!!! If you have not had a chance to see the release, you can see it HERE. This month's release is one of my all time favorite releases... I think you'll agree when you see all the inspiration on this hop! There will be three prizes of $20.00 Gift Certificates to the ODBD store for stamps, hidden on three different blogs along the hop. No one will know where they are! The winners will be randomly chosen from the COMMENTERS on these three blogs! The GRAND PRIZE of the entire Bread Basket Bundle will be drawn from the comments left here on this post, from all who tell us they completed the hop and which set is their most favorite! Now... on to the the details of my project. I wanted to play along in the Moxie Fab World Gingham Challenge, hence my gingham ribbon! I created a gift set including a card I gave a sneak peek of (one post below), and then I altered a little wicker picnic basket I purchased at Michael's. The basket was sponged lightly with THoltz distress inks in Scattered Straw, Frayed Burlap and Bundled Sage. The sentiment, little picnic basket image and inside decorative element are from the Thank You Sentiments set. I also stamped one of the pretty borders from a past release, Fleur de Lis Borders on the top of the lid. Outside this border I sponged with Scattered Straw Distress Ink, and inside I used Bundled Sage. The sentiment was cut with a Spellbinders Tags 5 and sponged with distress inks, then tied on to the handle of the basket with bakers twine. The image was stamped with Memento ink, then colored with Copics and cut out, and adhered to the center of the frame. To add a little decoration to the basket I added a Spellbinder's Lace Doily Accents border. On the inside of the cover is one of the pretty little decorative elements in the Thank You Sentiments set. With some yummy strawberry candies inside, this will make a fun little gift. Briefly, in case you didn't catch my sneak peek post, the card used the Thank You set for the image, and the Thank You Sentiments set for the sentiment. The image was colored with copics, and the red dotted panel is actually 100% cotton fabric which I cut with a Spellbinders Lacey Rectangle die, using my Grand Calibur. It cut like butter! Card base is Gina K, Black mat is SU!, Designer Paper is My Mind's Eye Lost & Found Rosy. The gingham ribbon for both projects is from Hobby Lobby. The doily border is the Spellbinders Lacy Doily Accents set. Now, from here hop to the sweet and talented Angie! Absolutely fantastic Grace!!! Love the little picnic basket!!!!! So cute! Love the basket! Grace what a lovely gift you made. That picnic basket is just so sweet - such a great thank you gift. Thanks for sharing. How adorable! What is it about red gingham that evokes such a happy feeling? I love what you did with this beautiful set. What a fabulous idea to give a gift in this adorable picnic basket. Your card, basket, and presentation of this set is beyond awesome. I love, love, love this gift idea. This is so beautiful. Thank you for sharing. I love this set you have created...so so cute!!!! Your card was so bright and beautiful, it made me smile! I love the basket too. I am VERY impressed! God bless! I love the saying about writing your sorrows in the sand, it has such a strong meaning to me. I love your designs, they are all so calming. Thanks for sharing your beautiful work. So creatively awesome, Grace!!! and a great combo of sets too!!! How gorgeous Grace!! I just love the bright colors on the card with the material and your basket is just too cute!! The die cut border, the gingham and your coloring are stunning!! Praying you feel better!! Have a great time with the family. Very cute--I really like your altered picnic basket. Grace, as always your creations are jaw-dropping gorgeous! 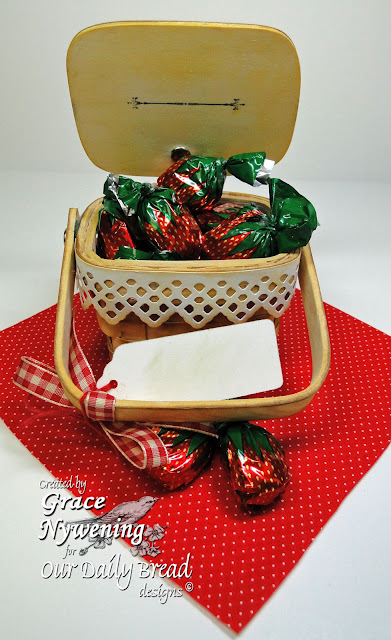 I love the basket idea...such a creative thing to do and fill with those luscious strawberry candies!!! Oh Wow these are fantastic, I love the basket!! Great sets and so much to do with these. The picnic basket is over the top. What a great idea - I wioll definitely be using that one!! Thank you for sharing your talents! Loved the summery card when it was your sneak peek! The basket is adorable! What a wonderful gift set, Grace! LOVE that sweet little basket! Oh, Grace...once again, you have left me speechless with your beautiful project! Love it, my friend! You are amazing. Such bright summery colours. That little basket is just too danged cute. Way to go. These are beautiful!! I especially love the basket. Love that green with the vibrant red, what an adorable basket.....makes me want to pack mine up and head to the park. Just lovely. Your colors are so rich! I have several of those little baskets and never would have thought of that. Thanks for the inspiration! I just love your basket! Actually both card and basket are so beautiful, vibrant colors and 'home-y' feel. Love the "sweet" picnic basket. How clever to decorate it! I am inspired to try one too. Thanks for sharing this lovely project! These are adorable, Grace! I love the country summery colors. And the basket! Wow! You've dressed it up so nicely! Grace, you are so talented. Your cards are so special. I like your site, too! your basket is adorable!!! love the candies and paper, they coordinate so perfect! I really love the basket stamp set it is really versitile. Great job! Such a great idea! The little basket is a treat for the eyes as well as the tummy. wow Grace, what gorgeous creations, I love that cute basket and beautiful card. Love how you matched the checkers. Beautiful, Grace! Love the little basket and your card is fabulous w/ the colors and polka dots. Wonderful projects! Lovely basket and card. The basket would be a great last min. gift if they were made and kept for just that purpose. Oh My--your projects are awesome. So Creative too--love the details! Just beautiful and so country, with that homey feeling.....thanks for sharing.....hugs. Gorgeous little gift basket and card, Grace! You did a marvelous job with these! Such wonderful details! Sending hugs! Will catch up soon! A stunning basket and card love the way you have stamped the basket lid. What a gorgeous remake of the little picnic basket gift. THe sentiment is so sweet. 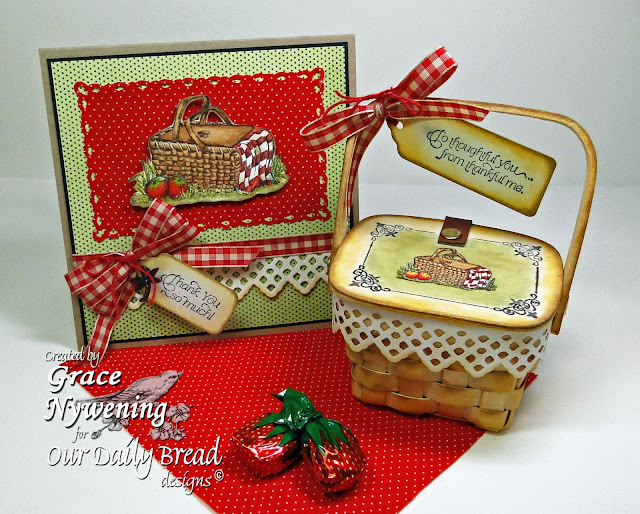 what a gorgeous set, grace... the little basket is just adorable and i love the CAS style of your card!! That little basket is just darling!! What a great idea! The combination of the little picnic basket and card! Makes me want to go on a picnic! Wow Grace....AWESOME!! I love you little basket, love your colour combos, and colouring...great set hun!! I love, love, love that little picnic basket. Oh, and the stamp too. Ha,ha,ha. Great little set. Would love to be the recipient of the adorable basket. What a great idea. It a very nice package of ideas. The strawberries are in season, what wonderful cards. Grace I'm sure there will be run on those little wicker baskets! Beautiful project and your papers are perfect for the picnic basket! thanks for sharing your artistic eye! I aboslutely love what you did with the picnic basket. What a fun way to use the stamp set. So creative! Oh my goodness! That basket & card are amazing! LOVE them! Your card and basket are just wonderful! I'm loving the sets you've used! Outstanding work, as always. How wonderful that you found a little basket to alter after stamping such cute ones on your set of cards! This is so cute. Love the card and then how you incorporated the theme (including color combination) into the picnic basket. This is a fantastic blog hop!!!! The basket and card are just precious!!! Love the colors.... thank you so much for sharing!!!! I love the little basket, who wouldn't want to receive that? Love the card paired with the basket...they just go together perfectly! What a beautiful gift basket and matching card. TFS. This ODBD set is perfect for your project. I love what you have done with the picnic basket. Grace, what a fantastic display of your projects. Great card and the little basket is adorable!! Wonderful idea!! What a beautiful basket and matching card. Would love to receive it. What a neat and brightly colored idea. Thanks for sharing it. Grace: I love this gift set. The use of the fabric on your card is beautiful. I love the colors that you picked. Your picnic basket is a lovely creation. Great work. Thanks for sharing your talents. How cute is that basket???!!!! Great idea to decorate it with stamping. Your little basket is the perfect gift item Grace! Love the red and white theme and your ensemble is amazing! Amazing card and I adore the little basket! Those are my favorite candies, too! Who wouldn't want one of these! Your set is really lovely. I especially love the way you decorated your basket! The colors for your basket and basket card are just beautiful. I'm a basket lover.... the person recieving that as a gift, will really enjoy it I'm sure!! Keep on Stampin for Him!! This is so adorable. Its a great idea and you made it sound so easy.I cant wait to try this. Beautiful gift set - love how you altered the basket from Michaels! Wow!! love that altered picnic basket!! and the matching card also!! Your set is just darling. Love how you've coordinated the card and the basket for a gift giving event.So Sweet!! I love the way you did this. Thanks for sharing. Cute projects! Love the picnic basket and theme, and that gingham ribbon! Lovely picnic basket, you have put a lot of effort and detail into this. I love what you did with the basket. Great idea. The card was very nice as well. Awesome project! I really like the card and the basket is terrific. What a nice gift set! Absolutely GORGEOUS set Grace!!! I love it all, down to the little strawberry candies ~ how perfect! Grace, you did a fabulous job! 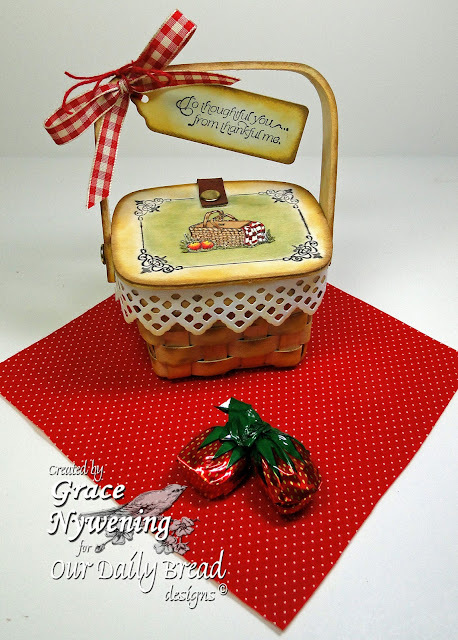 The altered basket is just adorable, and the card is lovely. Every detail is just perfect (as usual!) Thank you for sharing! Love the basket stamps. wonderful project. THANKS SO MUCH FOR YOUR CARDS. IT IS SO FAB. THE BASKET IS AMAZING. THANK YOU SO MUCH FOR ALL YOUR HARD WORK. Just love the contrast between the green and red. Gorgeous effect. Grace this has to be my favorite by far!!!! 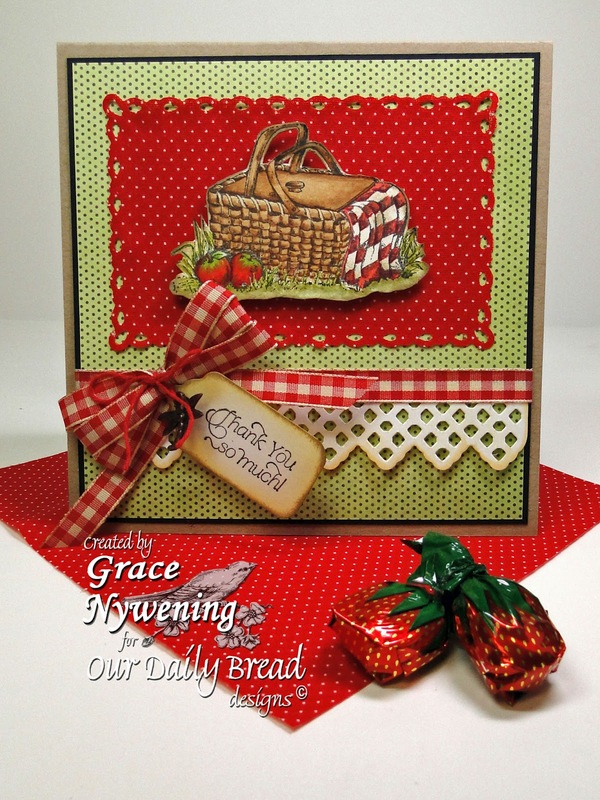 I LOVE the "country" feel of this card and basket!!!! You did a wonderful job! Adorable thank you set. Love the basket on the basket lid. Adorable!! Sure makes me feel like summer has arrived! This is just over the top!!!!! What a gorgeous prezzie for someone special. Love it! Your pieces are absolutely beautiful they way you colored them and set up the coordinating papers..lovely.lovely.lovey. How summery and fresh; I really like this combination and would love to be the one on the receiving end. You've showcased ODBD stamps beautifully! What a wonderful set Grace. Love it! That picnic basket is darling!